The Houston Safari Club President, Deb Cunningham has once again chosen the best of the best for a top auction item that was presented at the Houston Safari Club Banquet on January 17, 2009. She has followed the established tradition of commissioning the creation of a unique custom rifle as a major auction item, the proceeds of which go toward conservation, environmental projects, sportsmen's rights, and scholarships. This year the HSC president has once again selected Phil Koehne, owner of KDF Incorporated, the internationally renowned custom gun maker and inventor of the KDF Muzzle Brake, to create a rifle with very special appeal for the auction. This year the Diana motif is being used. It is extended to the floor plate and is in the fashion of high relief German style engraving. Diana was the equivalent in Roman mythology of the Greek Artemis. Diana was the perpetual virgin goddess of the hunt, associated with wild animals and forests, as well as the goddess of the moon. 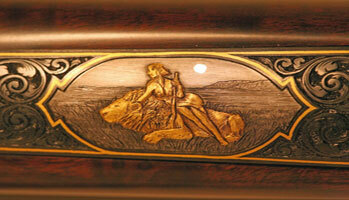 Notice the eloquently inlaid silver moon over Diana's shoulder. 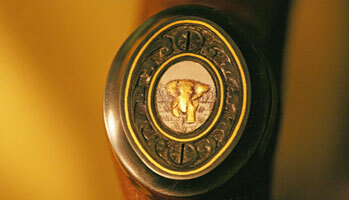 The grip cap is the Houston Safari Club gold-inlaid elephant , as this is the trademark of rifles built for the organization. The rifle is fitted with a barrel band front sight and a fixed leaf rear sight. 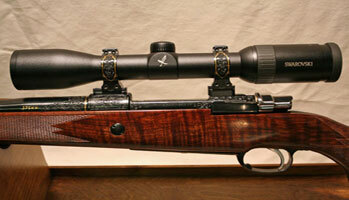 It comes with a Swarovski Z-6, 1.75-10 variable power scope, donated by Swarovski. The barrel in .375 Holland and Holland caliber was made especially for this project and donated by McGown Precision Barrels, of Kalispell, Montana. The floor plate was donated by Sunny Hill Enterprises Inc. of Chilton, Wisconsin. KDF Inc. has been building custom rifles for over 30 years. They have been associated with high end German hunting rifles since 1970 when the original company, Kleinguenther's Distinctive Firearms, was founded to import and distribute the Kleinguenther rifles made by Voere, GmbH, in Voehrenbach. In the 1980's, they imported rifles for the original Mauser company in Obendorf. For the past ten years, KDF has been specializing in selling, servicing, and customizing the high quality rifles made by Blaser in Isny, Germany. 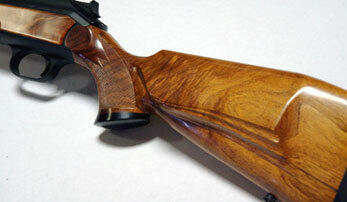 The Blaser rifle in the photos is an example of KDF's unique custom work based on Blaser components. 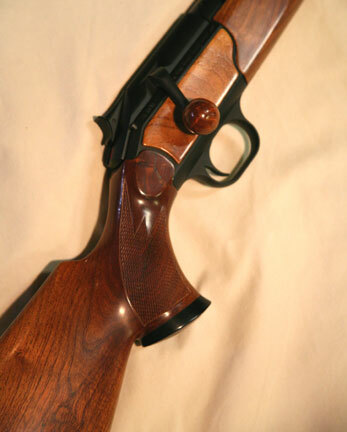 It is the only Blaser R93 stocked with Texas mesquite wood. All of the wood work was done by KDF. It is also the only Blaser in the world chambered for the .411 KDF Magnum caliber, a very effective round for Elephant and other dangerous game.